Have you seen any cool auto commercials lately? If you have, it is possible that Mudd Advertising had a part of its creation. I want to share this great room divider story about one of our customers. Mudd Advertising who is Chrysler’s “preferred supplier” for all Chrysler advertising and marketing needs, wanted a product that could provide two temporary rooms for training. After researching the market, they chose Screenflex and they are glad they did. 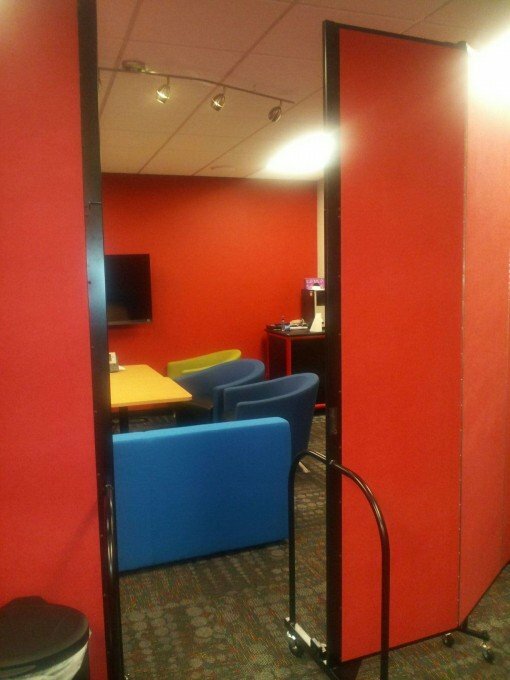 When Mudd Advertising International Ad Agency of Iowa first built their training room, the plan was to put in place a movable wall providing one large room for large training sessions and two smaller rooms when smaller training rooms were needed. Somehow the plan for this wall was mistakenly missed by the builder and inevitably this forced Mudd Advertising to search for a comparable option. 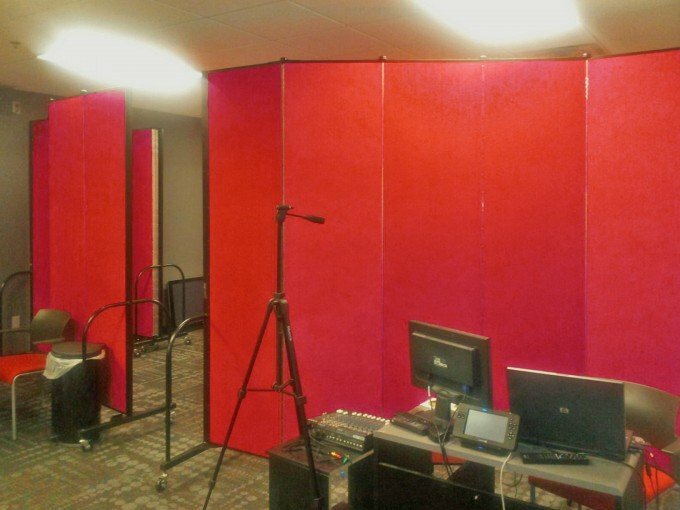 Screenflex was contacted and Mudd Advertising liked the flexibility of our product so three Standard 8′ 0″ H x 9′-5″ L room dividers were purchased to set up to create the two rooms (pictured). It was important that the portable walls did not interfere with their lighting, equipment or ceiling sprinklers. We were able to suggest dividers that would be easy to put in place and would not disturb the utilities. 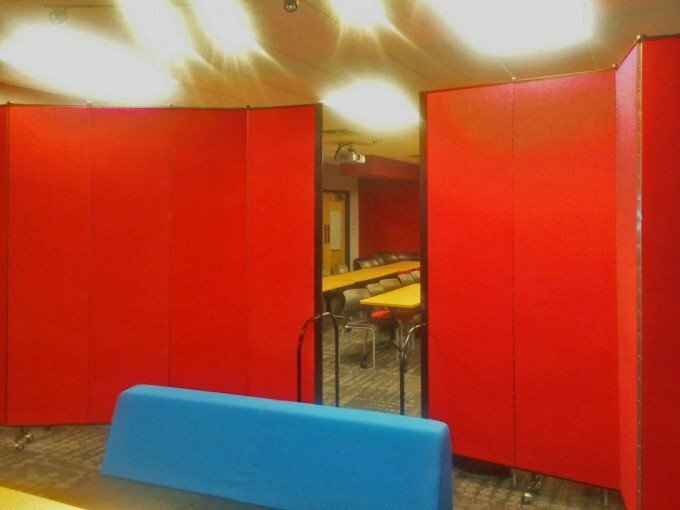 The dividers work great for us – utilized in our training room and in the creative area separating Marketing and the Artists. Great Product! They work better than we thought. Mudd Advertising’s 20-acre campus is quite impressive. Owners met with Disney engineers to build their film studio. This is where they shoot Chrysler, Ford, GM, Lexus as well as 700 auto dealer’s television and web commercials. The film studio can hold an audience of 200 and sets consists of 5 or 6 cars (large studio). Another interesting element about Mudd Advertising is that Clifton Lambreth and Jim Mudd Sr. co-wrote a new book called the “The Ad Man” – a story with key elements of leadership that will help any professional find the tools needed to succeed. This is a story about Jim Mudd who owns a radio station. He loses everything and starts over. The book explains how Jim re-invents himself in a completely different industry and what it took for him to succeed. His book is now used to help with sales training in the auto industry. I read this book and found it motivating for anyone who is looking to succeed in business and in life. Believe you can, and you can. Belief is one of the most powerful of all problem dissolvers. When you believe that a difficulty can be overcome, you are more than halfway to victory over it already.